Hersheypark's new Laff Trakk will be the country's first indoor, spinning glow-coaster. 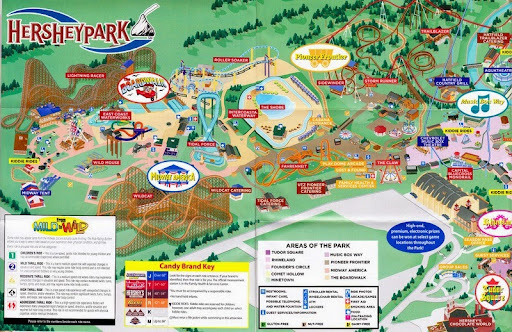 Laff Trakk will be built inside a 130-foot-long by 75-foot-high red, white and blue building along Midway America. Officials are calling the ride a 21st century fun house. It will re-create some of the iconic images from old Hersheypark fun houses, such as the 1938 fun house Whoops and 1940s Laugh Land. The new ride will feature Laffing Sal, a mechanical laughing woman that was above Laugh Land's entrance until the ride was dismantled in 1971. Visitors will ride in four-person cars that spin around as the car travels along the 1,400-foot track through a dark building that will display glowing images from old fun houses, as well as a hall of mirrors and house of cards. The coaster will reach speeds of 40 mph. The glowing designs will be created by Raven Sun Creative, a New York immersive entertainment design group. The ride will last about 70 seconds, and handle about 850 riders per hour. The new ride continues Hersheypark's commitment to coasters. The park opened SkyRush, the park's tallest, fastest and longest coaster, in 2012. The 212-foot-tall steel coaster features wing seating in which riders in the two outside seats dangle in the air as the coaster whizzes at 75 mph. Last year, the park debuted the Cocoa Cruiser, a steel coaster designed for families.